Bannister and Landy- contest over one mile. To raise the awareness of an individual’s capacity to act to positively influence the eradication of extreme poverty from our world. The pun in the title to this post, unintended when drafting this entry, sums it up best. Not only is this about moving past, as is beyond, barriers that are thought to exist. More so, it is about moving, or better stated as “removing” past barriers- barriers that were once, but now no longer are. This entry was posted in Awareness, Discomfort, Roger Bannister and tagged Barrier, Confidence, Roger Bannister. 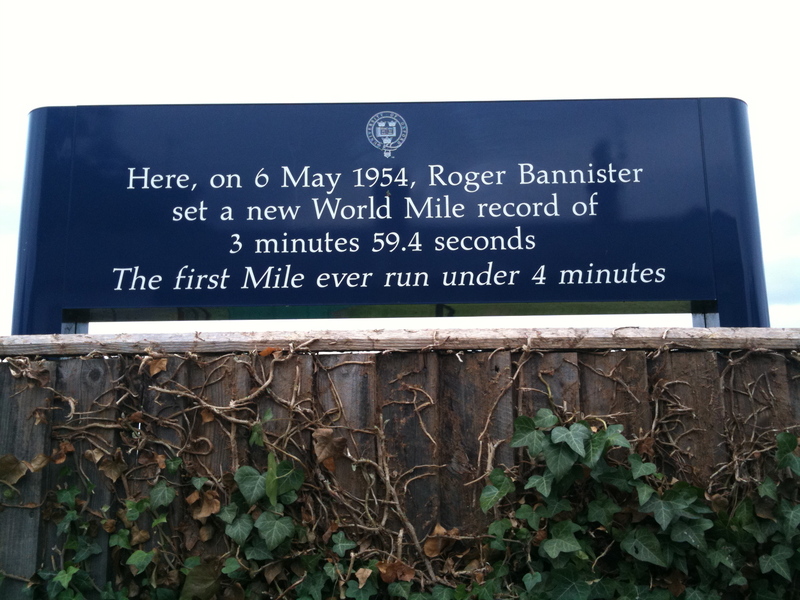 While running in Oxford last year, I passed the track where Roger Bannister broke the 4 Minute Mile in 1954. This was a surprise to me, as while I knew he had done that in the past, I didn’t know where it had occurred. Stop and think just how much of the technology in our world today is made up of what was once considered impossible. 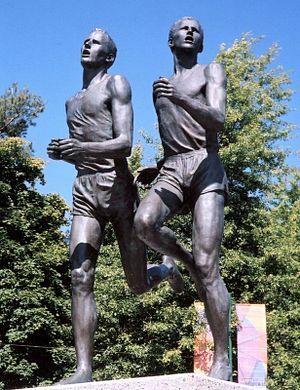 The claim that a 4-minute mile was once thought to be impossible by informed observers was and is a widely propagated myth cooked up by sportswriters and debunked by Bannister himself in his memoir, The Four Minute Mile, 1955. “This race made me realise that the four-minute mile was not out of reach,” Sir Roger Bannister, 2 May 1953 after running 4:03.6 and shattering previous 1945 standard record. The complexity of extreme poverty is not something to just wish away. The human cost is staggering. The amount spent on aid across the last 30 years beggars belief. This year is a critical moment to grip up the situation of extreme poverty affecting children in our world. The United Nations is committed to a 2015 timeline. The US has today announced the end of American combat operations in Iraq. The G20 Summit being held in Seoul can take a more informed view of the past and projected impact of the global financial crisis. Five years might sound like a long time, but it will pass very quickly. There is a great sense of urgency with which we as a global village need to address this problem of seeking an eradication of extreme poverty looking first at a time horizon of 2015. It is one of many problems to address. In Australia, the state of Indigenous health and gap in life expectancy remains a disgraceful legacy of the past. The competing demands across our global village are so complex it is sometimes difficult to comprehend. “Are you crazy! ?” some people ask me about this global endurance challenge, recognising the difficulty in what I am seeking to undertake, just from a logistical perspective alone. I agree, it is definitely a “stretch goal”. While these things might seem fanciful and far removed from the earnest consideration of the reality of extreme poverty, I believe they also are powerful ways to communicate the ability to achieve what is believed to be outside of our grasp. I can’t do this on my own, and I seek your support. Please consider sponsoring the development of the book “Above the Line”. Together, we can make a difference. This entry was posted in Extreme poverty, impossible, Roger Bannister and tagged Four Minute Mile, Poverty, Roger Bannister.